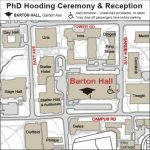 “Walking early” is permitted, so candidates may participate in the PhD Hooding Ceremony prior to their degree being finalized. All participants of the academic procession should be inside Barton Hall and lined in place by 4:45. The ceremonial program begins promptly at 5:00 as music begins and the University Marshal leads the formal procession of candidates, faculty, trustees, deans, provost, and president. All PhD candidates will be hooded on stage during the ceremony. When the ceremony concludes, an informal reception will follow inside Barton. All are welcome to enjoy refreshments at the reception until 7:00pm. 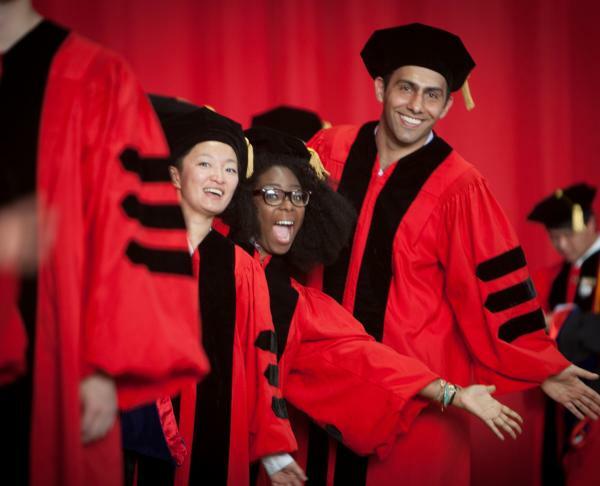 Doctoral regalia must be worn by PhD degree candidates, and may be rented or purchased. A rental outfit will include a PhD robe, PhD hood, soft tam, and gold tassel. 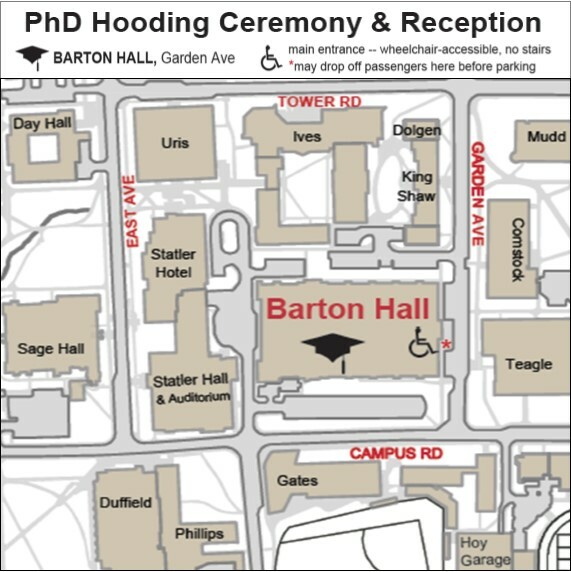 You should wear your PhD regalia at the PhD Hooding Ceremony on Saturday, Commencement on Sunday, and your college or field ceremony during the weekend. The robe and hood must be returned by 5:00pm Sunday, but the cap and tassel are yours to keep. Order your rental cap & gown by April 15 if you plan to walk in May. It is not necessary to wait until your degree is finalized. Pricing, link to order, and all instructions are on the cap & gown page. Arrive at Barton Hall. Wear cap & gown, but carry your hood. Report to alphabetic tables along the red curtain to receive a name card for the reader to announce your name and field of study during the ceremony. Carefully proofread all information on the card and make changes, if necessary. Ushers and Graduate School staff will be there to distribute name cards, assist with regalia, provide instructions for carrying your hood, and lining up for the procession. Must be in place to participate in the procession. Procession in Barton Hall begins the ceremony. A reception in Barton Hall will follow the ceremony. PhD candidates are encouraged to invite special committee faculty members to this event. Two formal invitation cards to give to faculty are provided in the PhD Commencement Packet from the Graduate School, but an invitation is not required for them to attend. Invited faculty will not be hooding candidates, but may participate by walking in the formal procession wearing academic regalia and be seated in the faculty area located in front of the stage. Faculty planning to attend as a guest, not walk in the procession, may sit in guest seating areas and do not need to wear regalia. All faculty are welcome to enjoy the reception immediately following the ceremony. Campus roads around Barton Hall are open at this event time on Saturday, and special permits are not needed for general parking. Guests may park in spaces near Barton Hall, including Hoy Parking Garage. To avoid stairs, enter Barton Hall from the main entrance located on the Garden Avenue side, not from the Statler Hotel side. To reduce walking distance, guests may be dropped off at the Garden Avenue entrance before parking. Ushers are there to assist with unloading, and are also available with courtesy wheelchair shuttles to transport guests from the main entrance to seating areas, if needed. Floor seating is available in Barton Hall and does not need to be requested in advance. Guests with wheelchairs and walkers will be able to sit with other family members in general seating without requiring a separate or reserved location. However, earlier arrival offers best chance for the entire party to find seats together in floor seating (doors open at 4:15). Professional photographs are taken of PhD candidates on stage. Within two weeks following the ceremony, candidates will receive an email from Grad Images, offering an option to view and purchase photographs. For photo questions, please contact Grad Images at 800-261-2576 or giservice@gradimages.net. Candidates, please submit your RSVP online by May 22. It is not necessary to wait until your degree is finalized, as “walking early” is allowed. There are no tickets for this event, and there is no limit to the number of guests who may attend. PhD candidates are expected to participate in the university Commencement Ceremony on Sunday, where degrees are formally conferred. 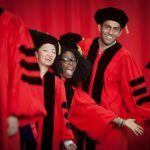 At 9:15am on Commencement morning, PhD candidates will gather on the Arts Quad wearing full doctoral regalia to walk in the academic procession to Schoellkopf Stadium, along with other degree groups. In addition to Commencement and the PhD Ceremony, candidates are also welcome to attend their college or field event.